"We believe that texture and accident, color, design and all the other elements of painting are only the means to a larger end, which is the depiction of man and his world." "I consider myself kind of a guy of three cultures; the Jewish culture, Russian culture, and American culture." "From all that I have seen, I am more than ever convinced that art must communicate, and it must represent, describe and express people, their lives and times." "I don't flatter my nudes, but at the same time there is no anger. And there is, I think, a great deal of sexual anger in modern art." "I choose to be a realist and a humanist in art." "I don't believe in the word 'modern' in art. Modern to me means fashionable. Clothes can be modern, but art goes on - it is timeless." "People ask me why the people I paint are always so sad. I don't know. It just turns out that way." Raphael Soyer was one of six children, but the transition was especially challenging for the teenage twins and their older brother. Soyer said, "Moses, Isaac, and myself found it very difficult to acclimate ourselves to this country, this language, because we came at a time of adolescence and we kind of withdrew within ourselves and became kind of alienated people." While his sisters quickly assimilated into the culture, making new friends and thriving at school, the boys struggled during high school. At the age of 16, Soyer was relieved to be able to leave school to help support the family, but he continued to attend free painting classes in his spare time, selling newspapers by day and developing his art by night. He became a dedicated and committed painter. On the day that World War I ended in 1918, he was working on a portrait at the National Academy. He heard distant sounds of celebrations and parades, but while his peers left to join the party, he remained in the studio with the model to finish his work. His passion for painting women earned him the title "the East Side Degas." As Raphael's painting career took off, so did Isaac's and Moses', inviting the usual sibling rivalry, especially with his twin. Raphael Soyer said, "Moses was outgoing. He brought the first friends to the house. He brought the first girls to the house. I was the more timid. There was, to tell the truth, much rivalry between us. People saw within our work a family likeness which we both sought to destroy. As soon as we were able we went to different schools. We worked in different studios." Guy Pène du Bois, the artist and critic and later Soyer's teacher at the Art Students League, recognized the young artist's promise and introduced him to the dealer Charles Daniel, who gave Soyer his first solo exhibition in 1929. The show was a success, and in the years that followed, Soyer's work gained national acclaim as a marked departure from the abstraction that had begun to take over the art world. In 1931 he married Rebecca, a Warsaw-born kindergarten teacher, and he later went on to teach at the Art Students League of New York. They had a daughter, Mary, who would grow up to become a psychiatric social worker. Soyer was quite short - standing 5'2" - and shy, but he learned to overcome his difference and became popular in artistic circles. In 1932, the famous Mexican artist Diego Rivera was commissioned to produce a mural on the wall of the Rockefeller Center, which was later destroyed because of the inclusion of a portrait of Vladimir Lenin. Soyer was taken by Rivera and would sketch him as he worked. He frequented the Communistic John Reed Club and became friends with artists Ben Shahn, Edward Hopper, and Henry Poor. While he found common ground with other Social Realists, his adherence to the figurative style was derided as unfashionable by others. In his diaries, he described an encounter with the legendary Abstract Expressionist Jackson Pollock, writing, "Without greeting me he rudely said, 'Soyer, why do you paint like you do?' He pointed to an airplane. 'There are planes flying, and you still paint realistically. You don't belong to our time.' I could have said to Jackson, 'If I don't like the art of our time, must I belong to our time?' But I did not say that. I merely said that I paint the way I like to." Soyer was among a group of artists, including many who had associated with the Fourteenth Street School, who opposed the dominance of abstraction in the art world, and together they started the magazine Reality in 1953, in which they would publish their ideas. Soyer was known to his friends as a gentle man with quiet resolve, but he was outspoken about the dominance of abstraction in the art world and advocated for realism. "This arbitrary exploitation of a single phase of painting encourages a contempt for the taste and intelligence of the American public. We believe that texture and accident, color, design and all the other elements of painting are only the means to a larger end, which is the depiction of man and his world," he wrote in a letter countersigned by 45 other artists in Reality in 1953. Soyer's proclamation was met with consternation, causing a furor among the art world. During the age of McCarthyism, Soyer and his friends were accused of being under the influence of Communism and became the subject of negative press. 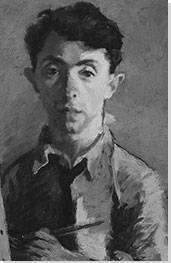 The rich cultural fabric of New York and its immigrant communities provided Soyer with a great source of subjects, and he became known for his sensitive portrayal of people - the transients, shoppers, dancers, and artists with whom he shared the streets of Manhattan's Lower East Side - giving rise to his reputation as a Socialist Realist painter. He also painted unemployed men, reflecting his fascination with the Great Depression and how its economic difficulties played out on ordinary people. He was more interested in psychology than politics and avoided subjects that were particularly critical of society. Soyer's determination to withstand political pressure and criticism and to tell the stories of these voiceless, marginal figures lends his work greater power. He was honored at the Whitney Museum of American with a retrospective in 1967, where his steady approach to realism and his dedication to communication were on view. Soyer, himself, responded to the show, "Looking at all these pictures, I didn't know whether to be pleased or distressed by the sameness, the thread of continuity I found there. Though the men and women who people my canvases cover a span of 40 years or more, they have changed little. Their costumes may differ slightly, but their bearing, their gestures, the atmosphere emanating from them are hardly changed." Soyer continued on this path well into his 80s, and he proclaimed never to get tired or bored of it, adding that he would feel physically or mentally ill if a day went by without working. He said, "My eyes bother me when I don't paint. But when I paint a full day, I feel satisfied and everything seems to be OK. I would never stop, never retire. My brother Moses died while he was painting. He was actually working on a painting, and the last words he said were to the model: 'Phoebe, don't frown.' Then he died. He worked to the very last minute." That was in 1974, and Isaac died seven years later. Soyer did indeed work right up to the end of his life in 1987. He taught into his seventies and painted for longer. He died of cancer at his home in Manhattan at the age of 87. At the time of his death, his dealer and friend, Bella Fishko, said, "I recently asked him what he was working on. He said, 'Painting disheveled girls, as usual.'" Just as the Impressionists Monet, Manet and Degas, toppled the wall between studio and real life by taking their art from the streets of post-revolutionary Paris, Soyer's compassionate look at Depression-era and post-World War II New Yorkers lent a new perspective. He hoped that viewers would empathetically respond to his depiction of workers, transients, and immigrants themselves, and not connect the depictions to a strong political message. In many ways, Soyer's eschewal of overt politics and his insistence on humanity and the individual's existential plight in the face of immigration, capitalism, and war was in step philosophically, even if not stylistically, with much post-World War II art of the time. Soyer also has a place within the larger international turn toward figuration seen in the second half of the 20th century with Contemporary Realism and the London School. His obituary in the New York Times noted his advocacy of realism and his prolific output across mediums, and he was described as the "dean of American Realist painters." Art critic Paul Richard said, "Many artists flare, then fade, but Soyer has been constant. His art, for more than 60 years, has been honest, heartfelt, humble." The most striking aspect of this double portrait is the symmetry of the subjects' expressions; Soyer's parents appear drawn and exhausted and their eyes resigned and tired. His father rests his head in one hand, while his mother's sturdy arms are folded in front of her body. They are sitting at a table, and behind them, one can see a cabinet with a mirror on top, a family photograph, and a light switch. The colors are muted and dull, but the brushwork is energetic, almost impressionistic.